then I moved it here. Couldn't decide which viewing platform was more beautiful! Request to my housemates: from now on, instead of the usual silences and mumbles in the morning, please greet me, as you behold my person in its crusty and ungroomed state, by saying, “Earth has not anything to show more fair.” And no smirking or snorting. Anyway, it’s a good line to store away for those moments when beauty takes us by surprise. The next time you encounter great beauty—holding a new baby, lying in grass on a Henry James kind of summer afternoon, gazing at the moon in late September—try saying Earth has not anything to show more fair. And voila! The desire to articulate transcendent experiences is satisfied. Finding words to capture beauty is one reason to turn to poets (they would like to be useful people), and that’s what I did when I discovered the view pictured above. 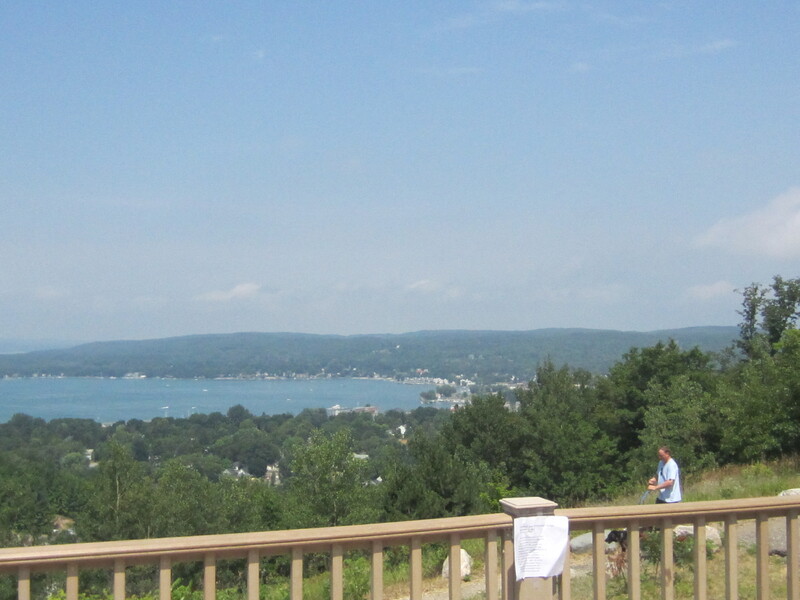 I had hiked up 2 ½ miles to the top of a hill just outside of Boyne City. Boyne City is a nice little northern Michigan town with a very good deli and three ice cream shops, but not bright and glittering by any standards. 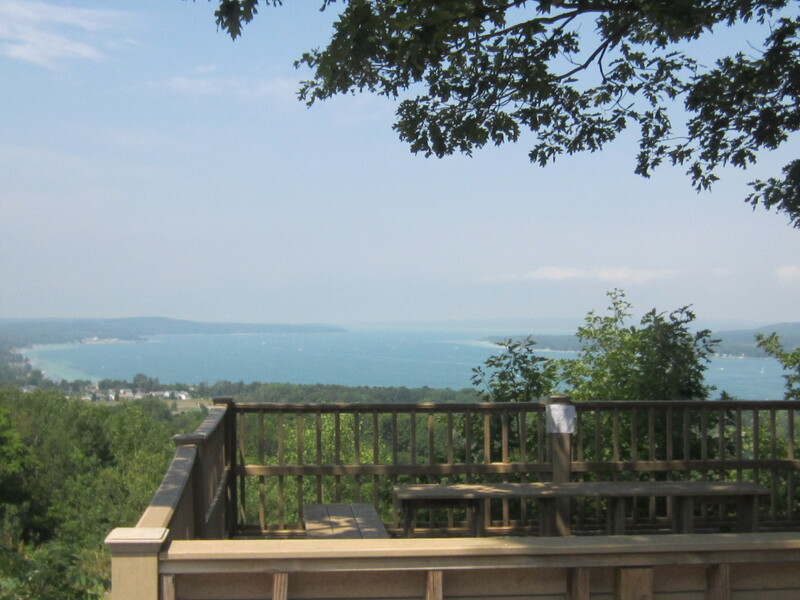 I wasn’t expecting much of a view, but when I arrived at the end of the trail and saw Lake Charlevoix spread before me in the sunlight, I laughed out loud. It was so magnificent and so splendid, and I was without a companion to whom I could make exclamations, so I laughed. And then I thought about who else I could share the experience with, and of course that got me thinking about what poem belonged there, and soon enough I settled on Wordsworth. No one better than he, that chronicler of the sublime, that “lover of the meadows and the woods,/ and the mountains,” as he calls himself in an earlier poem, “Lines Written Above Tintern Abbey.” A few days later I hiked back up the hill armed with scotch tape and “Composed Upon Westminster Bridge.” After a week’s time the poem was still there (hooray) but was gone the week after that. Is it just me and my naughty thoughts or is something deeply sensual going on here? The City before him seems female, a beautiful woman wearing a garment. The garment is bare and she’s lying about “open” to the valley and sky. The sun, which is identified as male, infuses her with light like a great big teabag while the river, also male, runs through her. That City sure is having a busy morning. Ah well, it’s probably best that I don’t analyze this poem too much. I’m in over my head with Wordsworth and his pals. I never finished the “Prelude” or understood negative capability and am irked to remember the B I got in Romantic poetry in college. Wordsworth was born in 1770 in England’s beautiful Lake District. After a happy childhood in one of the many beautiful homes he lived in throughout his life (be sure to look at Rydal Mount), he lost both parents by the time he was 13. When he was 20 he took a walking tour of Europe. Funny to think of these august poets as real people, footloose and fancy-free, no different than the unbathed backpackers of today seeking transcendent experiences in Amsterdam with dog-eared copies of Let’s Go Europe. In France he fell in love with a woman and fathered a child but left before the birth. Lack of money and the Reign of Terror kept him from returning to France, but he did provide financial support to his daughter. “Composed Upon Westminster Bridge” was written when he was on his way back to France ten years later to meet her for the first time and to make a settlement with his former lover so that he was free to marry his childhood friend Mary. That background information opened up the poem for me. 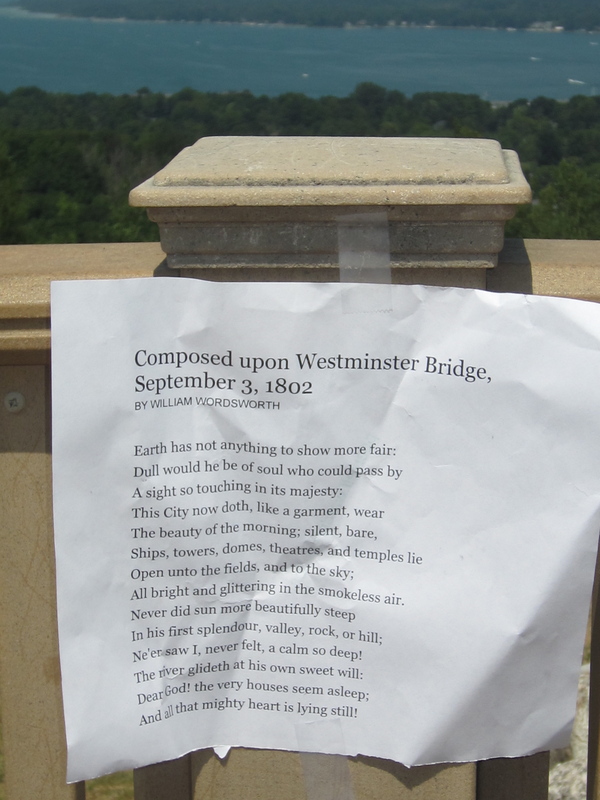 Here’s Wordsworth rumbling across the bridge on his way to make a new life. The city is still asleep, its “mighty heart is lying still.” Nothing has happened yet and anything still could. He’s bursting with a sense of freedom and possibility. A giddy sense of freedom and possibility is so often a byproduct of magnificent views. I think that’s why I laughed out loud atop Boyne City. All that beauty—life felt so big and grand—-I wanted to take it all in—-fling myself over it—dear God!—-Emotion! Tranquility! Daffodils!